A novel approach to food security Is fiction the way to engage people? It is so easy to forget that very few people know anything about plant breeding and how vital it is to having enough to eat. The time it takes, and the resources it needs — financial, genetic, human — are just not something most people know about. No wonder, then, that many people don’t quite grasp the urgency with which we need to get cracking now to breed crops adapted to predicted climate conditions. Susan Dworkin’s new book The Commons sidesteps that by hurling us 150 years into the future, to a world in which the failure to respond almost doomed our species to extinction. I thought it might be fun to talk to Susan and she agreed, but first I had to read the book. It turned out to be a rollicking good read, full of interesting characters and strange plot twists. All our old familiar friends are there. Large parts of the world have become very inhospitable, thanks to climate change. There’s an all-knowing Corporation that owns just about everything, including 85% of all humans in its domain. And the humans are shareholders in the whole enterprise. It all seems rather wonderful, except that there’s a problem: a new stem rust of wheat threatens a reprise of the famines and hardship of 100 years before. To say much more would be to give too much away. Let’s just say that the search for a solution is what drives the story forward. Of course, I’m not the intended audience, so I have absolutely no idea how The Commons will be received by anyone else. I’m not even sure what the author would like us to be doing now to avoid the future she depicts. That was just one of the topics we talked about in a discussion that could have gone on a lot longer. 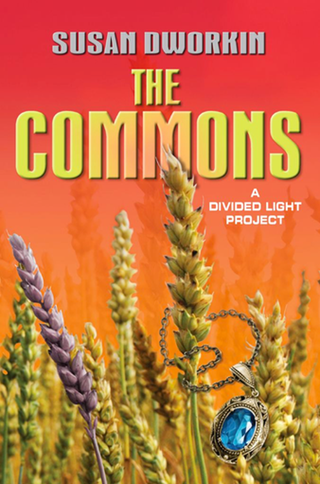 The Commons is available from Amazon as an e-book and a paperback. If you are in the Washington DC area on 24 October, Susan Dworkin will be lecturing on “The Weather in the Supermarket: Climate Change, Seed Banks and Tomorrow’s Food” at the US Botanic Garden. I “borrowed” the music — Mavis Staples singing Hard Times Come Again No More — from Beautiful Dreamer, a wonderful tribute album to Stephen Foster. Buy it if you don’t already have it (and if you like that kind of thing). The banner photograph is my own. As for the subject of this episode: I found your conversation interesting but probably won’t be reading the book. It does sound good but I’ve already got tons and tons of books to read in my queue. And, I see that I really need to get a flattr account set up.